As a financial coach, I often work with folks who are in the accumulation/growth phase of planning for retirement (i.e., 5 to 10 years or more away). Sometimes I come across someone who has either: 1) received a recommendation from their stock broker or insurance salesperson to purchase a fixed-rate, indexed, or variable annuity product inside an IRA; or has, 2) previously purchased one without fully understanding exactly what they purchased or why and are now questioning that decision. If you fall into either of those categories or are just curious about these “mysterious” financial products, I want to offer you some information and help. Annuities can be a very important part of a retirement plan, but they are also one of the most complex and misunderstood products out there. I hope to “de-mystify” them for you in this article and the next. 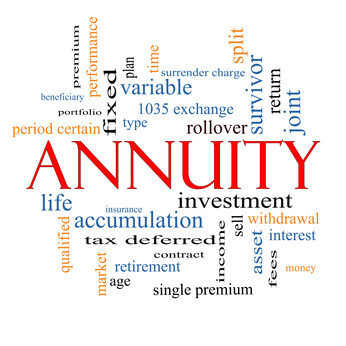 An annuity by definition is simply an agreement to make a series of payments of a certain amount of money to a specified party for a predetermined period of time. In the context of this article, it refers to a contract with an insurance company that makes those payments to you in return for handing over a certain amount of money to them, over time or as a lump sum. The amount of the payments will vary based on your age when you start receiving payments, how long the payments will be made, how much you gave to them, and other factors (interest rates, fees, etc.). All types of annuities have these basic characteristics in common, but some add additional features or benefits, usually at an additional cost to you. I am not a huge fan of certain types of annuities, especially when purchased inside an IRA. However, my general perspective is that annuities actually do make sense for many retirees. So I am not anti-annuities; in fact, as I will discuss in the next article, I think some annuities have an important role to play in retirement stewardship. When it comes to retirement income planning, there are good strategies and bad strategies, and good products and bad products. Annuities have their place but I am of the strong opinion that, for most retirees, annuities should NEVER – I repeat NEVER – be a majority of your portfolio because of their lack of liquidity and higher costs, which tend to be some of their biggest drawbacks. And keep in mind that if you are retired you probably already have (or will have) an inflation-protected, guaranteed income annuity called Social Security. Don’t invest in anything unless you can easily explain how the investment works to your spouse. That said, financial professionals also have a responsibility to do all they can to make sure their clients understand what they are buying and why which is why dealing with an adviser who is a fiduciary is so important. If you are dealing with someone who stands to make a big commission if you buy the annuity, be careful. You may want to talk with others who can give you unbiased input. Annuity products have become more popular because of their various guaranteed payout provisions. Depending on type of product, they combine some kind of lifetime income guarantee starting sometime in the future (i.e., “deferred”) with the possibility (important fact) of higher returns based on various market- (indexed) or mutual fund- (variable) performance or crediting methods unless a more conservative guaranteed fixed-interest-rate option is selected. Retirees are understandably nervous about the stock markets and are increasingly willing to pay for some peace of mind that comes with the guaranteed payouts. They want to secure more and more of their retirement income. So, as concerns about stock market volatility and longevity risk persist, advisers are recommending them more often. So let’s say you are 5 to 10 years from retirement and your financial adviser has recommended that you purchase some kind of annuity inside an IRA account. To do so, you may have to sell your some of your current IRA investments (most likely, stock and/or bond mutual funds or ETFs) and use the proceeds to fund the annuity. Or, you could purchase it with new money, which may initially be a relatively small amount. The more common scenario is a 401k/403b rollover where you are transferring your employer retirement savings or perhaps some kind of lump sum pension distribution into a new IRA. After the initial purchase, you can vary the amount of the future payments you make each month/year. With each payment, you are essentially making an IRA contribution. As such, there are the usual annual limitations based on IRS rules. Fixed-Rate Annuities pay CD-like (guaranteed) interest and in many cases pay higher interest than bank CDs. Fixed annuities can be either deferred or immediate. The deferred variety accumulates earnings based on regular interest payments and payout sometime in the future whereas the immediate type make fixed payments during retirement as determined by your age and size of your annuity. This type of annuity is the simplest and easiest to understand. They also tend to have the lowest fees. Deferred Fixed-Rate Annuities are usually recommended during the accumulation phase with Immediate Annuities being more commonly used to provide income in retirement. A Deferred Fixed-Rate Annuity can be converted to an Immediate Annuity at some time in the future when you decide to start receiving income. Variable Annuities are so-named because instead of earning fixed interest, your money is actually invested in some kind of mutual funds in “sub-accounts,” the value of which can vary over time as the value of the investments (stocks and bonds) held by the mutual funds themselves go up and down. Variable annuities typically have limits placed on both the upside and downside of your annual earnings. If your money is invested in stock mutual funds, you have the opportunity for greater growth in the value of the sub-accounts than with a fixed annuity. But, as with any stock mutual fund investment, there is also the possibility of loss. More variable annuities are being offered with a “Guaranteed Lifetime Withdrawal Benefit” (GLWB) rider (option), which can be very attractive. For an additional fee, you can get a guaranteed level of income for life (similar to a fixed annuity), but without having to give up access to remaining principal. Variable Annuities are more complex and they also tend to have fairly high fees. They often pay large commissions in the year they are sold. That being said, as with most investment products, they’re not “bad,” but they’re certainly not for everyone and are not appropriate in every case. They are often recommended for purchase as deferred annuities inside an IRA. Indexed Annuities, which pay interest at a rate tied to the performance of a market index (such as the S&P 500 and/or NASDAQ-MSA), have become very popular. This is mainly due to the value, interest rate, and payout guarantees with an upside based on a market segment (index) performance. With Indexed Annuities you are not investing in the actual underlying securities of any index — you are not buying an index mutual fund or making specific investment choices like a Variable Annuity. Your interest crediting options are based on formulas that the insurance company uses that are tied to a specific market index and they invest your money in whatever way they choose (usually diversified, conservative investments in their “general funds” accounts). The company just has to earn a return higher than their mathematical formula (or interest crediting option) so they can pay you, their sales force, marketing, operations, etc. This is why most Index Annuities will typically only generate low single digit returns. Those kind of returns are already available with conservative stock and bond mutual funds that can be held in an IRA outside of an annuity, but then you would not have the guaranteed income options which many find so attractive. If you purchase an annuity inside an IRA, it will probably be either a variable or indexed deferred annuity. As such, you may be told that it “isn’t really an annuity, at least not yet.” That is a somewhat misleading statement but partially true in the sense that the account has not yet been “annuitized,” meaning you are still in the accumulation and growth phase and are not receiving regular annuity payments. However, it is still an “annuity” in that it is governed by an annuity contract and all of its associated terms and conditions, including commissions and fees. Almost all annuities have surrender charges. If you were to terminate the contract and try to transfer your money to a different IRA investment, you could incur a charge, typically between 5% and 10% in the first few years of the contract. However, the longer you wait to surrender it, the less the penalty will be — the charge usually goes down 1% or so on each contract anniversary date. However, depending on the contract, it may take 7 to 10 years or more before there is no penalty whatsoever. The bottom line is that there aren’t a lot of compelling reasons to purchase a Deferred Variable Annuity inside an IRA account during the accumulation/growth phase. You don’t receive additional tax advantages (you are basically using a tax-sheltered investment inside a tax-deferred vehicle), or investment options (in fact, you typically have a limited set of options from which to choose), beyond what the IRA itself offers. But by far the biggest issue, especially during the accumulation phase, is cost. You will pay an annual fee plus a potential surrender charge if you change your mind. These charges are in addition to the management fees and additional expenses that each mutual fund charges as well. In most cases, the fees to the insurance company alone can amount to about 1% to 2% a year — and that comes right off the top of any earnings in your account. Let’s take a closer look. Let’s say you have two IRAs, one for you and one for your spouse, with $50,000 in each. One is invested in a variable annuity with all the money divided equally among five mutual funds. The other $50,000 is in an IRA invested directly in the same five mutual funds, but not in a variable annuity. You make an annual IRA contribution of $6,500, which includes an over-50 “catch-up” contribution in each. Let’s say over the next 10 years the mutual funds averaged a 6.5% annual return. How much will you have in each IRA account after those 10 years? In the first one, invested in the variable annuity, you have $167,289, whereas, in the second one, invested directly into the mutual funds, you have $187,272. That is a $19,983 difference. Why? The variable annuity charges about 1.5% a year in fees that you did not have to pay in the other account that directly invested in the mutual funds. Any mutual fund management fees would be the same for both accounts. There are no tax consequences in either account since both are IRAs. So, let’s add this all up: no additional tax benefits, high costs, surrender charges, and complex contracts – I think you get my drift. Not to mention the fact that you are effectively limiting your access to your funds during a time when you really don’t need to. The alternative, of course, is to keep your money directly invested in mutual funds in either a Traditional or Roth IRA. This is what I would recommend most of the time. Then, if you decide that an annuity would be beneficial to you in the future you can convert some IRA assets to a Fixed Immediate Annuity at any time. I will discuss this further in the next article. What if you’ve already purchased a deferred annuity inside your IRA and what to get out of it? Well, the reality is that the insurance companies make it rather difficult. Because of the possible penalties involved, you should think long and hard about surrendering an existing annuity contract. If you do decide to surrender the annuity, you will need to follow a specific process to ensure that there are no IRS penalties or taxes applicable. Because we are talking about an annuity that is owned inside of an IRA account you can roll your funds out of the variable annuity and into a regular IRA at a bank, mutual fund company, or brokerage firm of your choice. (I would recommend Vanguard, Fidelity, Schwab, or USAA – if you have a military background or family ties.) Since your funds would still be inside of the IRA “wrapper,” it is considered a transfer or rollover and no taxes are due on such a transaction. HOWEVER, YOU MAY HAVE TO PAY A SURRENDER CHARGE TO THE INSURANCE COMPANY. Unfortunately, depending on the size of the annuity, that could cost you thousands and thousands of dollars. Again, think long and hard about this! If you decide to do it, be sure you do a DIRECT ASSET TRANSFER in order to rollover your IRA assets to another company. The company you choose can help you with that process. This option would NOT reduce the fees paid to the insurance company — they would continue, but your total costs could be less. If it’s not time for an annuity, then what? There are some decent variable and indexed annuity products out there, but you probably don’t need them in your IRA during the accumulation phase before retirement. Maintain a diversified portfolio in your retirement accounts and wait to purchase an annuity when it makes more sense — more on that in the next article.